My first experience with Red Wing boots came after a moment of blinding pain. The boss had just cut a piece of cast iron pipe held steady with my foot. The snapped piece of pipe rebounded against my ankle. After swelling went down, we visited Vern to inquire into some boots. Vern operated the local Red Wing Store; he kept a supply of discarded boots for the discerning budget-minded tradesperson. Ten dollars later, I had safely protected my ankles, looked stylish, and felt like a professional. My sixth pair were purchased over a decade ago. As a “second pair”, they avoided the nastiest of abuse. None the less, after a dozen years, the heels were crumbling and holes had appeared in the soles. Without visible stitching around the lower, I assumed they were not recraftable. A call to Red Wing proved me wrong. After debating resole vs replacement, I went with factory restoration for my 953s. Red Wing cuts off the old sole with a band saw, cleans it up with pliers and Dremel, and sews on a new welt. 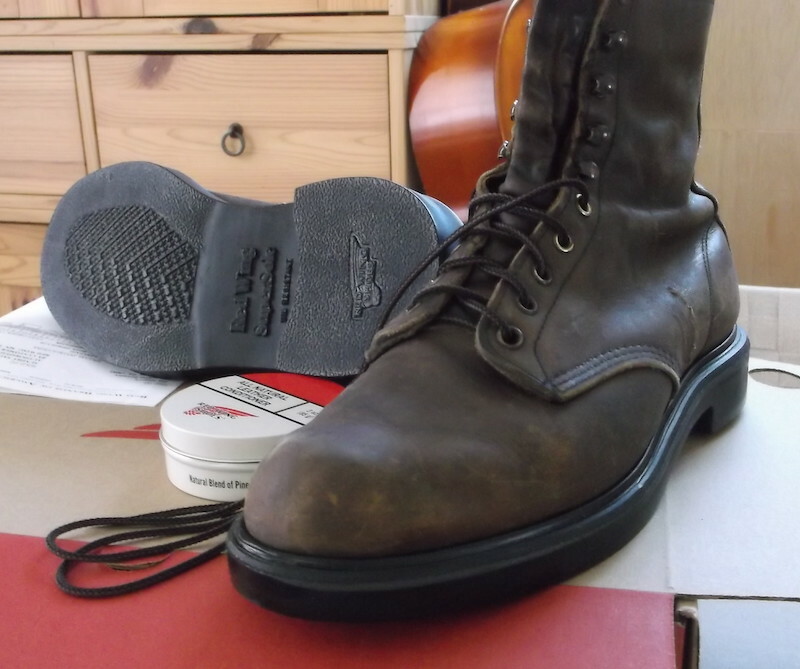 The boots then go onto original factory machinery, where new soles are poured in place, directly bonded to the boot. The Chevron Super-Sole® is a urethane which goes into the mold as a liquid and hardens in about ten seconds. Finally, the leather is conditioned and new laces expertly laced over and under. The lace tips line up, a skill which eludes me to this day. It was about two weeks roundtrip from handoff at USPS to delivery by UPS. Not new boots, but my boots. Same stains and cuts, broken in to my feet. About half the cost of new boots. This entry was posted in Product Review and tagged 953 Men's 8-inch Boot, Chevron Super-Sole, discerning budget-minded tradesperson, recraftable shoes, Red Wing Boot Store, red wing resole, red wing restoration.